The Nymphaeum, or main public fountain of old Philadelphia, as Amman was named in Hellenistic and Roman times, dates back to the end of the 2nd century AD. It is only a short stroll away from the Roman Theater and Odeon. Nymphaea were built over caves with running water, which were believed to be sacred to mythological nymphs. They were areas of public gathering and seen as a sign of a city’s wealth. 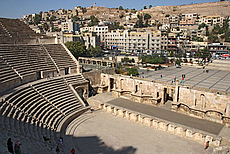 According to the Amman Nymphaeum Project, the Roman urban plan organized Philadelphia into two main parts: the upper one with the main Roman Temple of Hercules and the lower part, which follows a typical Roman city plan with two colonnaded streets (Cardo and Decumanus) along the major two valleys of the city. The Nymphaeum was located close to the point where the Cardo intersects with the Decumanus. With its monumental structure that used to be richly decorated with carvings, mosaics and statues, the Amman Nymphaeum is a half octagonal building with symmetrical design. The lower part is the foundation including the barrel vaults, and the upper part includes the main façade of the building and its rear. Restoration works restarted in 2015 through the Amman Nymphaeum Project, implemented by the University of Jordan’s (UJ) Hamdi Mango Centre for Scientific Research, together with archaeology professors and students from the University of Jordan, Petra University and the Hashemite University, in cooperation with the Department of Antiquities of Jordan and the Greater Amman Municipality, funded by the US Embassy / Ambassador's Fund for Cultural Preservation (AFCP).